Mechanics Illustrated, entered the comics arena with what had by then become standard: a generically-titled monthly anthology with a superhero in the lead spot. The title of their first release was Whiz Comics, and the hero was Captain Marvel. Writer Bill Parker and artist Charles Clarence ("C.C.") Beck (the team behind Spy Smasher, Ibis the Invincible and other early Fawcett characters) crafted a story of homeless newsboy Billy Batson, who (foolishly, by modern standards) followed a mysterious stranger into an abandoned subway tunnel. 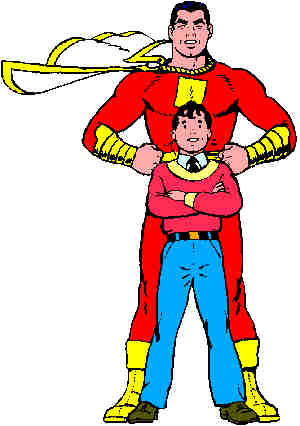 There, Billy met an aged wizard named Shazam, who gave Billy a special power: Whenever he said the wizard's name (which was an acronym for Solomon, Hercules, Atlas, Zeus, Achilles, and Mercury), Billy would be transformed into the World's Mightiest Mortal, Captain Marvel. The character was an instant hit, possibly because of the lighthearted touch Beck, along with writer Otto Binder (which rhymes with "cinder", not "kinder"), who wrote the majority of his stories, brought to him. More likely, however, this was because it addressed a desire shared by all children — the ability to make themselves bigger and stronger and able to deal with the frustrations of their lives in a physical, viscerally satisfying way, and yet be their regular selves when the power is not needed. 1941 was a banner year for Captain Marvel. He got his own title. He starred in the very first movie about a comic book superhero — a 12-chapter Republic serial starring Tom Tyler, also known for his portrayal of The Phantom. And DC Comics, Superman's publisher, launched a lawsuit accusing Fawcett of having patterned Captain Marvel a little too closely on their character. As the legal proceedings proceeded, Fawcett expanded the Captain Marvel franchise — one of the most successful in comics — by adding Captain Marvel Jr. and Mary Marvel to their lineup. All three Marvels, plus three Lieutenant Marvels and the elderly Uncle Dudley Marvel, joined forces in Fawcett's Marvel Family title. Marvel-mania reached a point where, in 1942, Hoppy the Marvel Bunny, a funny animal who wore an outfit identical to Captain Marvel's, became the lead feature of the monthly Fawcett's Funny Animals. By 1953, however, all comic book sales, particularly those of the superheroes, had sunk to the point where Fawcett was ready to throw in the towel. They settled the still-running lawsuit with DC, agreeing never to publish the character again. Only a faint echo remained — L. Miller, a British publisher, replaced him with the very similar Marvelman. Fawcett sold its remaining titles to Charlton Comics (where Hoppy was renamed "Magic" Bunny) and retired from comic books. They returned in a very limited way four years later, taking over the comic book version of Dennis the Menace from Standard/Pines, but never again used any of their old characters. The next (and final) time Binder and Beck worked together was in 1967, when they did Fatman, the Human Flying Saucer. Both are now dead. During the 1960s, two new Captain Marvels made their appearance. In 1966, Carl Burgos, who, a generation earlier, had created The Human Torch, created a short-lived hero named Captain Marvel for M.F. Enterprises; and in 1967, Marvel Comics, claiming ownership of all uses of the word "Marvel" in comics, chimed in with a version of their own. Later, they killed him off and created another, completely unrelated Captain Marvel to replace him. In 1973, the original returned, when DC leased the character and all his spin-offs (the human ones, anyway) and brought him out under their own imprint. Because of Marvel's trademark, however, the name "Marvel" could not be used in the title, so the new publication was named Shazam!. It featured a mix of new stories (the first few of which were drawn by Beck) and reprints. This revival lasted five years, inspiring a live-action Saturday morning TV show along the way (which he later shared with a new character, Isis). Later, they stopped leasing the character and simply bought him, along with all the rest of Fawcett's superheroes. Since then, there have been occasional attempts to revive the Shazam! series, including a try at making Captain Marvel a member of the Justice League. But none has lasted more than a few years. It seems odd that a character with such obvious child appeal — one who can make himself big and strong just by saying a magic word — is unable to find success in the modern world. That may be because these revival attempts lack the unique contributions of Binder and Beck — or it may be because comic books are no longer read by children.